Not many are aware that chronic diseases can teach lessons. Sickle Cell has taught Kaela Johnson how to use what should have been a debilitating weakness and make it her greatest strength. She has learned how to turn a “no” into a “yes” and a “you can’t” into “I did”. Her diagnosis would mean many days in hospitals, and lots of doctors and nurses but she eventually gained a true passion for medicine. Her time spent in the hospitals also allowed her to see and learn how people could have faith in hopeless situations. Her fascination for medicine and compassion for people lead her to want to study pediatric medicine. Unlike many people her age, Kaela was limited with the types of activities in which she could participate. Her pain crisis and sickle cell episodes would arise at the most inopportune times like during “tryouts”. But her strong will and competitive spirit made her turn her obstacles into opportunities and learn how to trust in her abilities. If she could not make the sports team as a player, she still found a way to contribute by participating as a manager. She would learn how to support her team just as her family, and friends supported her during her hospital stays/illness. With tenacity to live to the fullest, she learned to balance her life as an athlete, community servant, and maintain stellar grades in her advance placement classes. She further developed her strong work ethic by serving in the community as a volunteer at Riverside Hospital during her summers. The volunteer experiences would help her better understand the significance of serving and connecting with those in need. 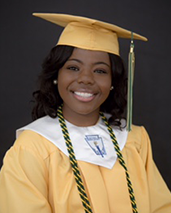 Contrary to the fact that many children with sickle cell experience difficulty in school because of sickle cell related absences, in 2015, Kaela graduated second in her high school class and with the help and support of the Patient Advocate Foundation she entered Virginia Commonwealth University, her choice school, with a standing of a first semester sophomore. Kaela has continued her academic success and her commitment to community service at VCU, as a Dean’s Scholar, a member of the Honor’s College and recently named a National Society of Collegiate Scholar. She has acclimated into college life and found ways to serve others through the NAACP at VCU, the Foundation for the Immediate Medical Relief of Children (FIMRC) and Carver Promise. As a student majoring in interdisciplinary science with a concentration in health preparations she carries a 4.0 grade point average and is well on her way to fulfilling her dream of becoming a doctor. Drawing on her own personal experiences with the disease she is considering a specialization in hematology, as she feels that she can relate to those patients who may have similar experiences.